Lloyd Dobler Effect are full time touring musicians having performed in over 40 states and 13 countries. Their list of accomplishments include: winner of the 99.1 WHFS Big Break Contest that pitted Lloyd Dobler Effect against hundreds of area bands; headlining multiple international Armed Forces Entertainment tours; and being voted one of the top ten best bands on the east coast in a Washington Post reader’s poll. They have performed on the same bill with such notable artists as Santata, Steve Winwood, The Fray, Jane’s Addiction, Eminem, The Goo Goo Dolls, Good Charlotte, The Roots, and Jack Johnson. LDE has a cover song repertoire of over 1000 songs that include all genres. The band works with you to pick what artists and songs you like and that is ALL they perform at your event. Additionally, the band is happy to learn and perform requests. 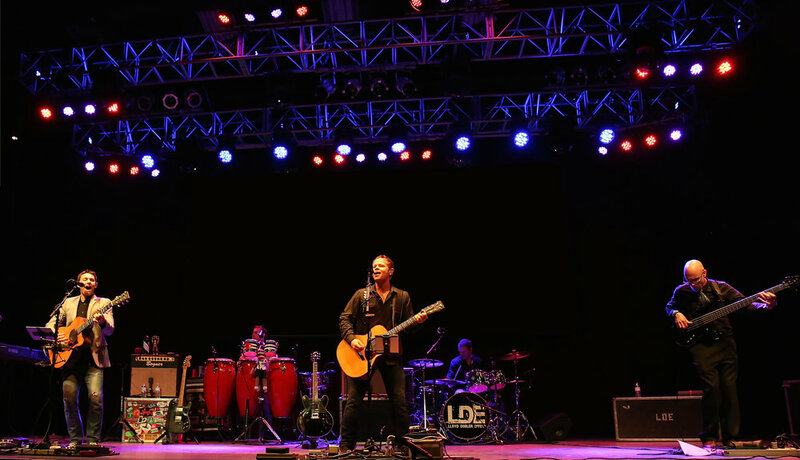 At weddings & special events, LDE handles all of the reception live music, the Deejaying, emceeing and the band lighting and PA rental requirements. LDE also has the ability to perform classical guitar duo music during wedding ceremonies and/or acoustic trio live music during the cocktail hour. Lloyd Dobler Effect’s multi-layered and upbeat music showcases their universal appeal to both mainstream modern pop & rock lovers and culturally diverse audiences.